Strong local economies require a strong local workforce, hence K-12 schools and higher education are a crucial factor in workforce preparation. Still, recent findings shared by the Missouri Chamber Foundation’s plan, Missouri 2030: Agenda to Lead, highlights mismatches between education and workforce pipelines in Missouri. Do Missourians have the requisite skills they need to gain employment and succeed in the workforce? What kinds of educational experiences do Missourians need to be employable? How does the education pipeline connect to the workforce pipeline in this state? Based on findings reported in Missouri 2030: Agenda to Lead, only forty-four percent of Missouri business owners are satisfied with the availability of skilled workers in this state. Those surveyed also indicated that high schools and colleges are not preparing graduates for the workforce. The Missouri Chamber of Commerce and Industry developed a dashboard to monitor statewide progress and national comparisons on its Missouri 2030: Agenda to Lead. Example indicators for “Preparing the Workforce” include Kindergarten readiness, fourth and eighth grade Reading & Math, Certified Work Ready Certificates, and STEM Program Program Completions. Importantly, the “workforce preparation” indicators identified by the Missouri Chamber of Commerce and Industry vary across the state. Similar data can be considered at the zipcode, county, and/or regional levels. Percent of adults with a bachelor’s degree or higher (2016), 4th grade reading proficiency, and 8th grade math proficiency. Click on image for interactive map. For example, this map above shows the of population with Bachelor’s Degree or higher (by zipcode), fourth grade language arts proficiency (by county), and eighth grade math proficiency (by county) in Missouri. After clicking on the map (for interactive features), toggle between layers (on right side of screen) to explore different data layers. Exploring these data, alone or in conjunction with other indicators highlighted in the Dashboard, may help local communities and regions identify local strengths and opportunities for growth in terms of workforce preparation and economic development. College and career ready definitions, metrics, and programs and structures vary by state. This interactive map compares states across categories and profiles each state based on these categories (see Missouri profile). DESE’s Office of College and Career Readiness reported that nearly 250,000 Missouri high school students and adults participated in Missouri’s Career Education system during the 2015-2016 school year. This system includes 57-area career centers across the state that provide training in academics and occupational skill training (learn more about Career Education and Career Education Support Materials). College and career data are monitored for accountability, including Career Education Program and Course Enrollment and Career Education Graduates and Completers Placement. These data offer a snapshot of Career Education System. According to a report on Career Readiness from the U.S. Chamber of Commerce Foundation, there is a need for new approaches to career readiness that accommodate a variety of pathways to promoting success-ready graduates. These pathways must rely upon diverse post-secondary education opportunities that are sensitive to labor supply and demand, consider alternatives to traditional 4-year college degrees, and consider employability, not just degree completion, as an outcome. For example, there is a growing emphasis on the value of apprenticeships in career development, and apprenticeships are just one example of how communities are aligning local education and workforce pipelines. 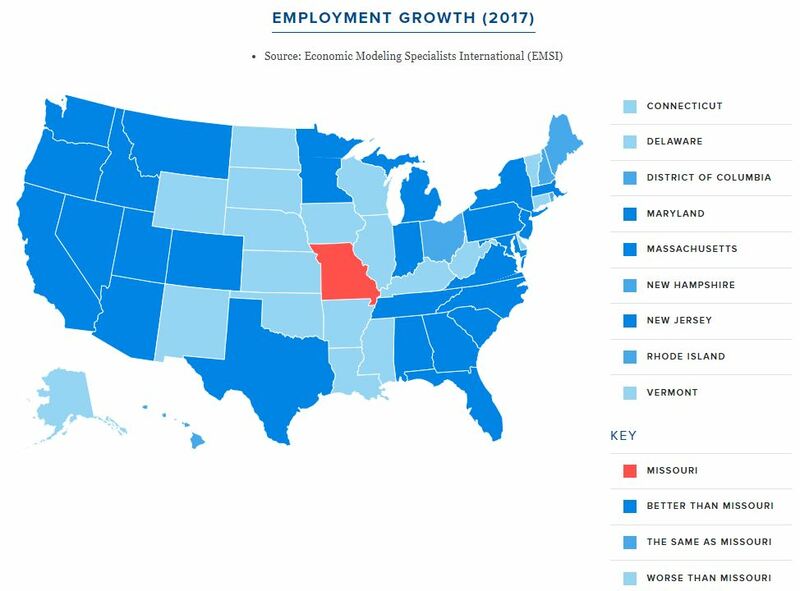 These communities can consider regional labor market and industry analyses conducted by the Missouri Economic Research and Information Center (MERIC). MERIC also produces an annual Missouri Labor Supply & Demand Analysis report and grades Missouri careers by assigning letter grades to occupations based on total job openings, percent growth, and average wage. A report produced by the Missouri Community College Association (MCCA) emphasizes the unique value-add of community colleges in addressing these gaps in labor supply and demand as well as two other gaps: the “middle-skills” gap and the “soft skills” gap. Middle-skills jobs require education beyond high school but not a four-year degree. These jobs comprise a significant proportion of jobs in Missouri (also see the Missouri Labor Supply & Demand Analysis from MERIC). While higher employment rates continue to be associated with higher educational attainment overall, strategic workforce preparation efforts requires an understanding of the labor market and what kinds of post-secondary training opportunities are required for different career pathways. Career and technical education, including community college programs that can be more responsive to labor demands, may be particularly successful in addressing acute and critical workforce shortages in some sectors in Missouri. For example, there is a healthcare workforce gap in Missouri. DESE offers resources for school districts interested in creating local pipelines to address teacher shortages. The Career Pathways Toolkit: An Enhanced Guide and Workbook for System Development is just one of many tools that can be used to develop comprehensive and cohesive state system for workforce development. More than 25 years ago, the Secretary’s Commission on Achieving Necessary Skills (SCANS) report was released by the US Department of Labor. This report examined whether or not America’s youth were prepared to meet the demands of the workplace. This report, building on decades of applied research in career development and allied fields, raised the visibility of so-called “soft skills” as needed competencies for employment. Extending well-beyond basic academic or technical skills, these non cognitive or occupational skills include communication, planning and organizing, self-management, technology, and problem-solving. These skills are sometimes associated with the P21 Framework for 21st Century Learning or other, similar frameworks with significant overlap. More recently, there has been a focus on employability. Employability skills are the basic skills necessary for success in the labor market, with a lack of employable skills associated with unemployment to some degree. Some experts question whether there is evidence of a serious skills gap or shortage in the US labor force (such as scholarship that suggests there is actually an issue of over-education). However, most agree that to be successful in the workplace, individuals must have a myriad of occupational or employability skills, technical skills, and academic skills. High-quality Career and Technical Education, in conjunction with afterschool programs and a variety of other supports in the home, school, and community, should be carefully considered when aligning education and workforce pipelines to support workforce development.